I am currently a Dance teacher at La Mesa Arts Academy. This will be my third year at an amazing school that incorporates the arts into school curriculum for students in grades 4th-8th. Teaching dance has been a passion of mine since a very young age. Growing up I studied dance from the age of 10, and over the years performed with many dance companies and schools. I continue to take class today to pursue my passion and stay with current trends. I hope to continue the growth within our Dance department at La Mesa Arts Academy. The practitioner- research I conducted with the LMSVEF grant helped me understand the importance and usefulness of accumulating evidence to find teaching approaches that help students learn tap techniques. Further, sharing my practice-based research evidence with other tap instructors for their consideration in their own teaching will be my contribution to research and teaching communities. The goal of this project was to compare the effectiveness of two tap-dancing strategies with middle-school students: (a) whole group instruction followed by group practices and (b) whole group instruction followed by independent practices. The effectiveness of the tap instructional strategies was observed throughout the tap instruction units by comparing students’ learning behaviors (skill learning and engagement) and assessing their growth. Observations and interviews showed that students who learned tap techniques by practicing with peers in groups were more likely to become proficient in the tap techniques as compared to students who practiced tap techniques independently. Also noted was that on average, students who practiced with peers were more engaged in learning than those students who practiced by themselves. However, although the findings in general suggest that proficiency, enjoyment, and engagement levels will be higher in groups practicing with peers, as compared to learning by practicing independently, it is important to note that students’ individual learning preferences should be utilized as much as possible when teaching tap skills, as shown in the student interviews. With these findings I will conduct my teaching in the coming years by utilizing the more efficient teaching strategy, while observing those students who might need extra or different instruction to learn tap skills. Research for this study took place at La Mesa Arts Academy in La Mesa, California. La Mesa Arts Academy is a 4th grade through 8th grade public performing arts school. The school is ethnically diverse with approximately 9% African-American, 5% Asian-American, 37% Hispanic-American, 40% White-American, and 9% other ethnically diverse students. Approximately 45% of students are socioeconomically disadvantaged. 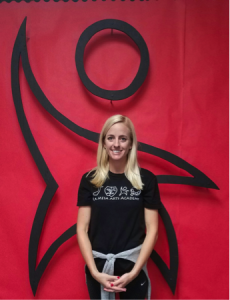 This school specializes in many different arts programs, including dance. There are two dance teachers and two dance studios at this school. The research for this study was completed by one of the dance teachers, using both dance studios. 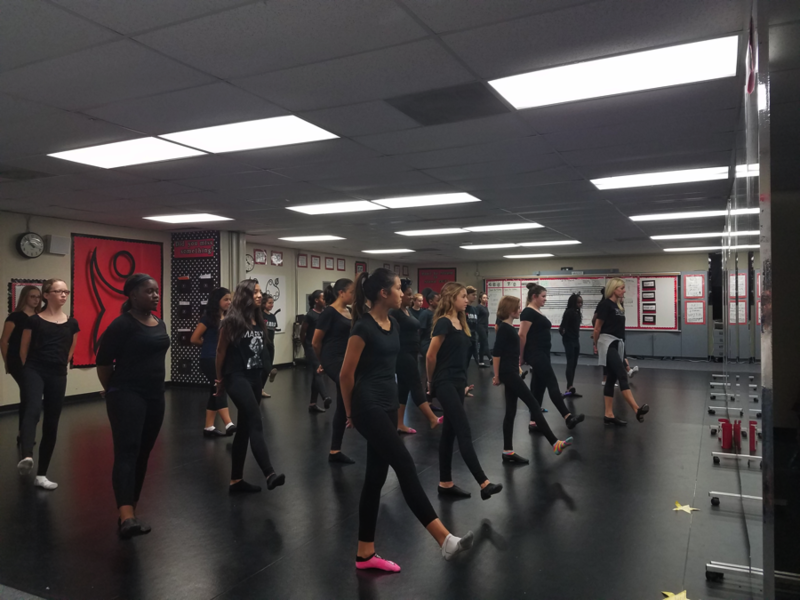 At the end of the school year (June), all students who participated in this practitioner-research performed the tap choreography at our Spring concert, which took place in La Mesa Arts Academy’s auditorium. The concert piece demonstrated skills that students learned in the tap unit. An important incentive for this research project was that the funds for tap shoes for tap classes were provided by the Educational Foundation, which encouraged students in both groups as well as tap teachers in learning and teaching tap skills. The research project helped me find a more efficient teaching strategy and encouraged me to continue searching for better strategies to engage students in learning tap dance. The goal for this research project was to identify if students learned introductory tap dance skills more effectively as individuals or in groups after a whole-group instruction. All students in this study learned tap techniques from the instructor/researcher. However, one group of students practiced as a whole group and then in small groups (Group A) and another group of students practiced as a whole group and then individually (Group B). The purpose of this research was to determine if students retained tap skills and performed better after practicing in small groups or individually. Finding no literature comparing tap instructional strategies, to the best of my knowledge this is the first study on the topic, adding significance to the research project. The research was conducted during the four-week tap unit in two of our seventh- and eighth-grade dance classes, in an ethnically diverse school with approximately 9% African-American, 5% Asian- American, 37% Hispanic-American, 40% White-American, and 9% other ethnically diverse students, and approximately 45% of students socioeconomically disadvantaged. There were 17 seventh graders and 19 eighth graders in Group A (n = 36) and 14 seventh graders and 16 eighth graders in Group B (n = 30). Of the 66 participating students, 2 were males. In both dance classes, the dance instructor began with tap skill demonstration to the whole group. Following the skill demonstration by the instructor, students in one of the dance classes (Group A) practiced in small groups, whereas in the other class (Group B) students practiced tap dance independently. In Group A, students in groups learned each tap technique or combination of techniques by observing other students and helping each other in learning skills. In Group B, students practiced each tap technique or combination as an individual. Students in both groups learned six basic tap techniques: flaps, buffalo, single time step, pull backs, riff, and crawl, followed by a combination of these skills. Skill Proficiency. The instructor monitored performance levels throughout the unit to identify how each class progressed. At the end of the tap unit, each student’s level of proficiency was measured using a three-point rubric (beginning, intermediate, proficient) on six basic tap techniques and a short combination. The data collected by the instructor/ researcher were compared between the two classes by assigning a number to each scale of proficiency (basic = 1; intermediate = 2; proficient = 3). Reliability estimates of the six basic tap techniques were .89 (Group A) and .92 for Groups A and B, indicating that the measures of each student across the six skills were highly consistent. Reliability estimates of the average of the six basic techniques and short combination scores were .89 and .95 for Groups A and B, respectively. Engagement. The instructor/researcher also monitored daily engagement among students by observation of students’ effort in learning tap techniques during the practice. In addition, the instructor also observed video recording at the end of the tap unit. A three-point rubric was used with a higher score indicating more engagement in learning (1 = slightly engaged; 2 = moderately engaged; 3 = very engaged). Student engagement (appearance of effort exertion while practicing) was recorded each week of the tap unit for each group instead of rating individual students. Student impressions about practice. Two students from two of the three levels of proficiency (basic and proficient) from both Groups A and B were selected for interview. Students were asked to express their impression about practice. Questions were “how did the practice session help you learn the tap dance?” If students’ response to the question was not sufficiently detailed, a follow-up question “why do you think it helped?” was asked. The interviews were recorded in written form by the interviewer and by audio tape. To compare the group performance in six tap techniques, a multivariate analysis of variance was conducted, followed by univariate analyses. Students in Group A performed better on average of six scores than those in Group B, statistically, F(6, 59) = 4.02, p = .002, and practically η2 = .29. Group means for each of the six techniques showed a trend that Group A performed better on average than Group B in most techniques. See below for Means (M) and Stand Deviations (SD). However, when each average technique score was tested for comparison, only Flap showed statistical and practical significance, F(1, 64) = 8.72, p = .004, with η2 = 12. The result of the analysis indicated that although the group difference was not statistically significant in each technique, when the scores of all techniques were combined, students in Group A who practiced in groups performed better on the whole than did students who practiced individually (Group B). Next, the average of six basic techniques and short combination scores were compared for Groups A and B (see above for the means and standard deviations). A multivariate analysis of variance showed again that students in Group A performed better on average of the two scores than did Group B students, F(2, 63) = 3.52, p = .035, with η2 = .10. Univariate analyses did not demonstrate statistical significance, especially on the Short Combination. The short combination was measured once at the end of the tap units. Due to the limited class time, the short combination might not have included enough techniques that could have differentiated the three levels of proficiency. In future research, this shortcoming should be considered when designing the tap unit and collecting data. In general, the findings suggest that when learning tap techniques, students learn more effectively when they can practice with their peers. Analysis of student interviews indicated that students in both independent and group practices enjoyed learning tap techniques for a variety of reasons. Interview summaries are provided below. Group A. Two students from Group A were interviewed. Student 1 was a proficient student and Student 2 was at the basic level. During the interview both students expressed they enjoyed working in groups during practice time. Student 2 expressed that she felt she could ask her peers questions if she had them and that this helped her to improve tap skills. Student 1 enjoyed the practices because she enjoys being able to talk with her friends and work together. These interviews indicated that when teaching a middle-school tap class, students may enjoy working in small groups to help each other master techniques and that they also enjoy the social aspect of working with their peers. Group B. Student 3, a proficient student chosen from Group B for the interview, expressed that she enjoyed working independently because she could hear her sounds more clearly. She was confident with the tap techniques and felt that the practice sessions helped her to learn as she could practice the skills alone repetitively until she mastered them. Student 4, a student with basic-level tap skills chosen from Group B, felt that during our practice sessions she needed more help when it was time to practice independently. During independent practice she expressed that she was not sure what to do to improve her techniques. After interviewing two students from Group B, I concluded that a proficient student may feel more comfortable with independent practice then a beginning tap student. These findings indicate that although one can find more effective instructional strategies in general, students’ individual learning preferences should be explored and utilized when teaching tap skills. Student Engagement. Student engagement, as shown for their level of efforts exerted when learning, was recorded each week of the tap unit for each group (see Table below). Note. 1 = slightly engaged; 2 = moderately engaged; 3 = very engaged. Both Groups A and B had strong engagement during week one and two, but Group B became less engaged in Weeks three through six. Group A stayed engaged through week four, but went to normally engaged in the last 2 weeks, five and six. After observing engagement in both classes, I noticed that Group A was most engaged and less distracted because they had time to work with peers. This allowed for conversation and teamwork, which kept engagement higher. Group B was less engaged as they worked independently every class and eventually seemed to become bored with the lack of variation that flexible grouping can add to a practice environment. The findings suggest that students who were allowed to practice in groups stayed more engaged and put forth more efforts to learn tap skills, compared to students in the group with independent practice. Based on the data collected in the two classes, I found that when teaching introductory tap skills to middle-school students, proficiency and engagement levels will be higher in groups in which students can learn skills more efficiently and exert more efforts with peers during practice sessions as compared to learning by practicing independently. However, it is important to note that as suggested by the remarks of two students in Group B, students’ individual learning preferences should be utilized as much as possible when teaching tap skills. The finding from this project will be utilized in my future teaching of introductory tap skills and will be shared with other dance teachers, and educators in general, through dissemination of the project report as a part of the knowledge base of Social Publishers Foundation. Project Learning Media presents a video clip of a tap-dance rehearsal.